The community room includes white boards, cabinet space, and tables that can be moved around to fit your needs. The community room has an open floor plan and is very spacious. 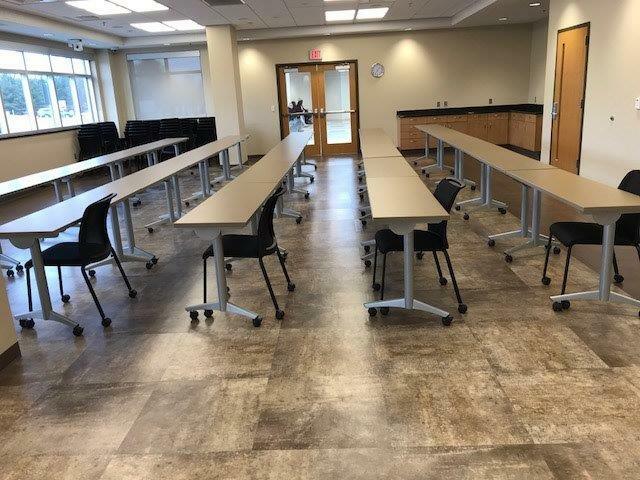 The community room includes tables and chairs that can be moved around to fit your needs. Banquet seating for 40 guests. The community room features a built-in projector and backdrop. The projector is available only during business hours. Convenient access to the front parking lot. Access to the community room from the parking lot. Plenty of parking spaces for the community room. The kitchen has plenty of countertop and tabletop workspace. It also features an ice machine. The kitchen is well-equipped with appliances, including a gas stove, microwave, refrigerator, and freezer. Easily accessible fire extinguisher in case of emergency. The terrace is conveniently located near the kitchen. The terrace features four tables with umbrellas. Maximum occupancy of the community room is 90 persons. The FPB Community Room will not be rented to anyone less than 21 years of age. Renter must provide U.S. issued identification at the time of signed agreement. The renting party will be held responsible for any breach of these regulations. The premises are under 24-hour surveillance. Renter must come during Frankfort Plant Board business hours to receive tour. Renter to come within 48-hours before reservation to receive access badges and complete check list. The weekday fee during Frankfort Plant Board business hours (7:00AM-4:30PM) includes use of the Community Room and Kitchen only. 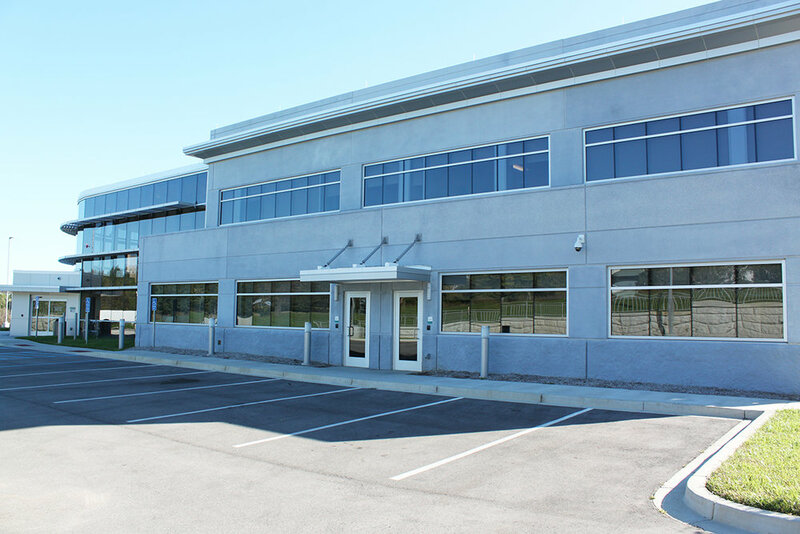 The weekday fee after Frankfort Plant Board business hours (after 4:30PM) and the weekend fee includes use of the Community Room, Kitchen, and Outdoor Terrace. No alcoholic beverages are permitted on FPB property. Tape, thumbtacks, push pins, etc. may not be used on the walls – Command Brand – Damage-Free Hanging permitted. Absolutely no glitter or confetti may be used on FPB premises. Only flameless candles are permitted. Birthday candles acceptable. Portable cooking equipment, including grills are not permitted on Frankfort Plant Board property. No smoking permitted inside building or terrace. Tables, chairs, kitchen facilities, active cable TV outlets (renter provides TV), local phone service, and normal janitor services are included in the fee. Music is not permitted during Frankfort Plant Board business hours. A projector is available during business hours only. Renter to provide laptop/mobile devices. The Community Room cannot be rented more than 12 months in advance. Non-Profit Organizations must provide appropriate documentation. FPB Employees agree that the Community Room will be used for the rental purpose shown, and either themselves or their spouse will attend the event. FPB reserves the right to require cash or money order for the security deposit and rental fee. FPB reserves the right to disallow future rentals if the rental agreement is violated, or unreasonable cleanup and repairs are required. Renter is responsible for having everyone off Frankfort Plant Board property by 11:00 PM. If not, it will be necessary for the Frankfort Police Department and/or Frankfort Plant Board personnel to disperse the group after closing time. A security deposit of $150.00 is required at the time of reservation. Renters may provide cash, check, or credit card (Visa or MasterCard with a $3.95 Western Union Fee) for payment of security deposit. The deposit will be utilized to make restitution for any damages or excessive cleanup time required of the Community Room property. This deposit will be refunded within 30 days from the date of rental, provided no damages and/or excessive cleanup were incurred. A Fire Extinguisher System has been installed to provide fire protection in the kitchen area. The system will automatically operate in case of a fire. If for any reason the system is manually discharged, the renter will be billed the cost of recharging the system and the cost of cleaning the kitchen. All outside caterers will be required to have on file with FPB current and appropriate documents pertaining to certification and licensing by a Kentucky County Health Department and any current business license issued by the City of Frankfort. Caterers must also provide proof of insurance listing FPB as an additional insured. No exceptions. These documents must be presented PRIOR to the event taking place at the facility. Approved outside catering must be delivered and cleaned up during rented time only. Renter agrees to indemnify, defend and save harmless FPB, its employees, and agents from all claims, demands, suits, actions, proceedings, costs, and damages of every kind and description, including attorney’s fees or other litigation expenses which may be asserted or made against or incurred by FPB, its employees or agents, on account of loss of or damage to any property or for injuries to or death of any person caused by, arising out of, or contributed to, in whole or in part from the performance of this agreement, or arising out of renter’s use of the Community Room or FPB Administration Building property. Refunds will be made if reservations are cancelled fourteen (14) days prior to reservation date. If reservations are cancelled with less than fourteen days (14) days-notice, money will be refunded only if the Community Room is rented to another party. In all cases, renters are subject to a $50.00 non-refundable cancellation fee. Frankfort Plant Board has the right to cancel reservations due to exceptional circumstances (plumbing issues, weather damage, fire, etc.). Any cancelled reservations of this nature will not be charged a cancellation fee. Under such circumstances the General Manager will authorize a cancellation fee waiver without penalty. In the event of a major service outage, Frankfort Plant Board reserves the right to cancel reservations. Any cancelled reservations of this nature will not be charged a cancellation fee. Cathy Jennings at cjennings@fewpb.com or call 502-352-4479. Rental payment can be made via cash, check, or credit card (Visa or MasterCard with a $3.95 Western Union Fee). Checks should be made payable to FPB Community Room, and must be paid 30 days prior to the rental date. Reservations cannot be made without advance payment of the security deposit. Frankfort Plant Board will not be responsible for personal belongings left on Frankfort Plant Board premises. Cathy Jennings at 151 Flynn Avenue, Frankfort, KY 40601. If you have any questions, please call Cathy Jennings at 502-352-4479.